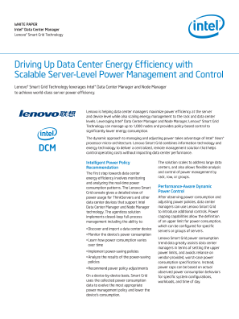 Lenovo is helping data center managers maximize power efficiency at the server and device level while also scaling energy management to the rack and data center levels. Leveraging Intel® Data Center Manager and Node Manager, Lenovo® Smart Grid Technology can manage up to 1,000 nodes and provides policy-based control to significantly lower energy consumption. The dynamic approach to managing and ...adjusting power takes advantage of Intel® Xeon® processor micro-architecture. Lenovo Smart Grid combines information technology and energy technology to deliver a centralized, remote management solution that helps control operating costs without impacting data center performance. The solution scales to address large data centers, and also allows flexible analysis and control of power management by rack, row, or groups. After observing power consumption and adjusting power policies, data center managers can use Lenovo Smart Grid to introduce additional controls. Power capping capabilities allow the definition of an upper limit for power consumption, which can be configured for specific servers or groups of servers.